Over the past 5 years the Church Hall has been totally transformed into a facility of which the community of Amblecote can be justifiably proud. We have be most generously financially supported by the Big Lottery fund, Dudley Metropolitan Borough Council - Stourbridge Area Committee and through the fees paid by our many hirers. Some of these are regular hirers, others occasional hirers and those who have just held a party on one occasion. To celebrate the completion of the major work it was decided to hold an event to thank everyone involved and this took place on Saturday 14th July, 2012. The evening began when Fr. Alan Williams welcomed and introduced our guests and proceeded to thank all those involved in the project. 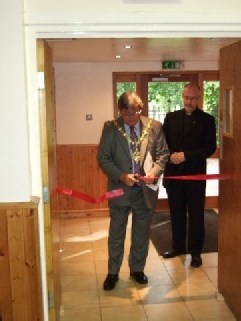 The Mayor of Dudley, Councillor Melvyn Mottram J.P., graciously performed the ceremony of cutting the ribbon. He made an accompanying speech and then later presented acknowledgements to those involved in the refurbishment work. The Mayor was accompanied by his lovely wife Michelle. We were joined by a number of our local Councillors, past and present. Mr. Ron Jones, our main contractor, was thanked for his hard work over many years and received a handshake and presentation from the Mayor. The Mayor then made a presentation to Matthew Hill who has raised thousands of pounds through many grant applications on our behalf. 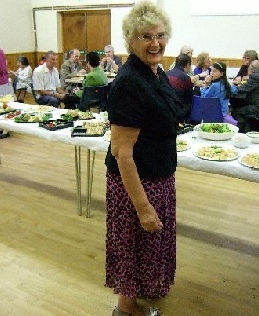 Elizabeth (Liz) Walker is one of our local councillors and a lay reader at Holy Trinity. She and her husband Michael were also celebrating a rather special Wedding Anniversary on 14th July. Behind any event there are the unsung heroes who make things run smoothly. John Easthope and Colin Hill did a wonderful job of ensuring that everyone had plenty to drink and cleared up afterwards. What is a party without good food? Was the food good - you bet it was. 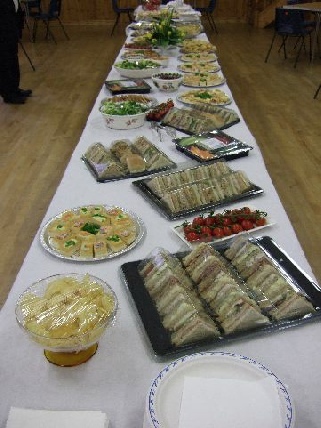 Thanks to (in alphabetical order) Barbara Banner, Doreen Easthope and Maureen Viney the catering was an absolute triumph. Thanks must go to Martin Taylor for helping to set up the venue and clearing up afterwards but especially for looking so smart (unfortunately the webmaster did not manage to capture an image). Also to the many others who helped without having to be asked. Our sincere thanks to all the dignitaries, guests, hirers, friends and members of the congregation of Holy Trinity, Amblecote who made the evening such a relaxed and enjoyable occasion, but most of all to Lyndon Viney who came up with the idea of ‘having a bit of a do’ and doing so much to make this work.